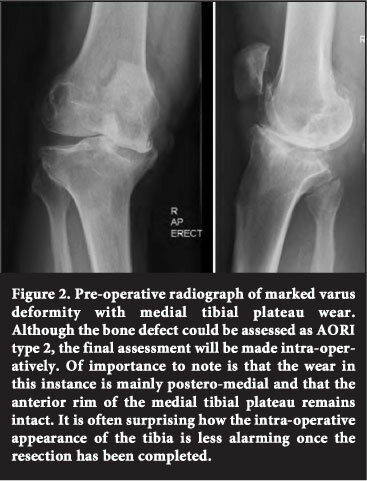 Dealing with bone defects in primary and revision knee arthroplasty is challenging and requires careful planning to define and quantify the deficiency. Pre-operative clinical, radiological and intra-operative assessment facilitates the classification of the defect and instructs in the appropriate bone replacement and implant strategy. This paper reviews the assessment and treatment options. Deficient bone stock in knee arthroplasty can be challenging to manage to ensure a good functional implant with long survival expectancy. Loss of bone is encountered in the primary and the revision scenario, each presenting unique challenges requiring solutions. In addressing these cases the basic principles of total knee replacement (TKR) must be applied so that the underlying problem that caused the failure can be addressed to avoid recurrence. Joint line restoration, flexion and extension space equalisation and component rotation restoration and ligament balance are the areas of major focus. Soft tissue balance will in most cases be satisfactorily restored with adequate biomechanical restoration, but when the ligamentous envelope has been damaged, a plan to deal with it must be available. Although co-lateral morbidities or contributing factors may affect the outcome of the reconstruction they do not materially alter the way in which the mechanical problem is addressed. The BMI and obesity, level of activity, individual's age and life expectancy, smoker status and other co-morbidities are all important for outcome from a general point of view. Of prime concern is to re-establish implant stability in all planes. Motion will lead to loosening and implant failure. Similarly, bone grafts will fail to incorporate unless protected against excessive loads. Peripheral bone loss with eccentrically supported implants will lead to predominantly angular and longitudinal instability. Central bone loss, in particular in the tibia, will give rise to rotational instability. On the femoral side, loss of the posterior condyles, commonly encountered in revisions, will also result in rotational instability. The rotational alignment of the new implant may be difficult to locate properly if there is significant loss of anatomical landmarks. The epicondylar axis is probably the best indicator for setting implant rotation, but be prepared to modify this if hip rotations would suggest a different position or if there is a suggestion that the patella will track awkwardly. If this is appreciated only with the femoral trial component in place, consider modifying the femoral cuts being aware of the influence this will have on the flexion-extension gap. The influence of previous fractures or extra-articular deformity must be taken into account and accommodated. Bone loss, if extensive, may result in the loss of anatomical landmarks making recognition of the joint line difficult to identify without the restitution, the mechanical integrity of which will be compromised. The fibular head, patellar tendon insertion, patellar height and femoral epicondyles are the most useful landmarks. If necessary, the opposite knee can be used as a reference guide. A good principle, throughout orthopaedic surgery, is to endeavour to replace lost tissue with the same material. In this case it is preferable to replace the lost bone with bone, and not non-biological material. Hence for 'Plan A' an adequate amount and type of suitable bone graft material must be available for the procedure, as well as provision for adequate protection for the graft material while incorporation proceeds. In the eventuality that bone graft, either autograft or allograft is not available or indicated to achieve stability, 'Plan B' must include the availability of a suitable array of implants that can deployed to achieve component stability. While all of the aforementioned are of paramount concern for the surgical procedure, the main purpose of this paper is to highlight methods of addressing bone deficiency. The importance of thoughtful pre-operative planning cannot be over-emphasised as this will give a good indication of the bone graft and implant requirements1,5 although provision must always be made to allow for change as the circumstances dictate. Before the surgery is undertaken a thorough appraisal of the extent and location of the bone loss is required1,6,7 so that adequate plans can be laid to accommodate each eventuality. Over the years a number of authors have attempted to define the bone loss in descriptive classifications. These include the Dorr, Rand, Bargar and Gross; Elia and Lotke, Insall and Sloof; Anderson Orthopaedic Research Institute (AORI); Massachusetts Gen Hospital; Salai et al;7Clatworthy and Gross; and the Huff and Sculco classifications. All, except the University of Pennsylvania classification, are based on the intra-operative assessment of the extent of the loss, and the AORI, Massachusetts Gen Hospital and the Huff and Sculco15 include the pre-op assessment as well. Yi Yan Qiu et al16 in reviewing the published classifications, describe and illustrate each of these, debating their merits, and concluded that no single classification is ideal. 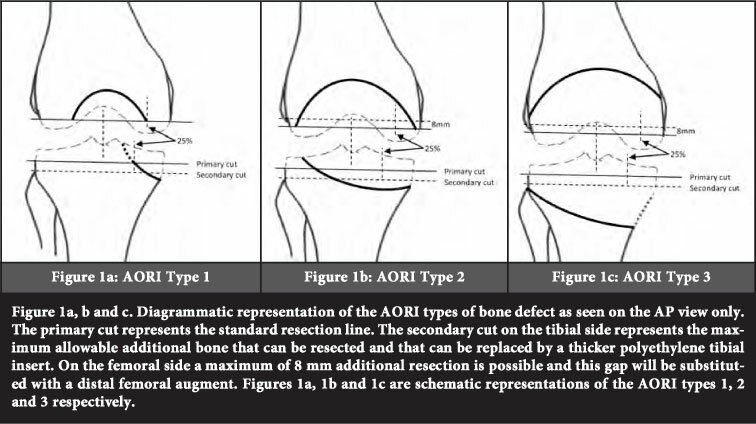 A study of these different systems shows that they vary somewhat in the degree of detail included: some are specifically for revision, some for tibia or femur only, and may or may not specify the size of the defect. In order to accommodate these deficiencies, a universal classification that incorporates all the stability scenarios, including patellar bone loss and soft tissue integrity, that can be applied to both primary and revision procedures should be developed. Standard AP and lateral radiographs are the primary imaging investigations (Figure 2). 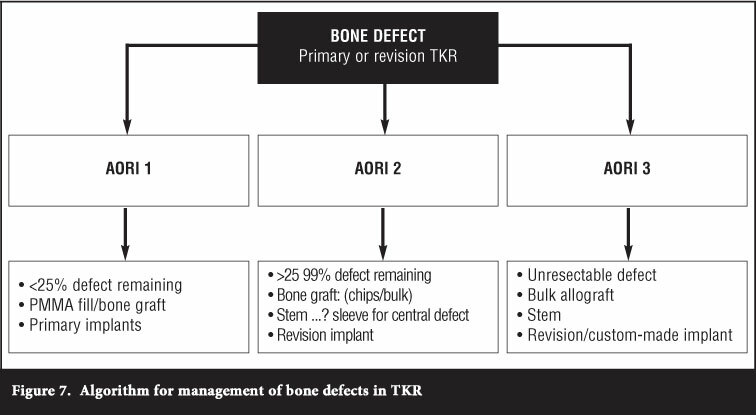 The assessment of the extent of bone loss is not as straightforward as it may appear, especially after a TKR has been performed. Occasionally CT, with 3D reconstruction, especially for severe AORI type 2 or type 3, is required to define the extent and location of the defects and to facilitate operative planning. An indication of potential trouble with the tibial component is lucency beneath the tibial base plate at the implant/bone interface. Because of load bearing, the space which develops at this interface becomes continually obliterated, masking progressive tibial component subsidence. The bone underlying this is reactive and may in fact appear more sclerotic. On the femoral side, particularly on the AP view, the prosthesis obscures the bone/implant interface making assessment difficult. Oblique radiographic views or fluoroscopic imaging is useful to improve visualisation in this area. An osteopaenic appearance of the epicondyles even without demarcation of the transitional zone is a clear sign of significant bone resorption from granuloma formation. The lateral view gives a much clearer view of the extent of bone loss than does the AP. Lucency beneath the anterior patellar flange, and most importantly, the posterior condyles are frequent areas of visible bone loss. 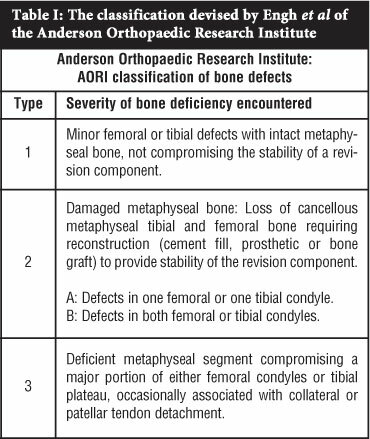 Although the use of a specific classification system is not mandatory, categorisation of the bone loss in these terms does assist with defining the defect and planning treatment options. Whether primary or revision arthroplasty, the principles apply to both procedures. The pre-operative planning serves to raise awareness of, and the anticipation for, the intra-operative situation. Although the pre-op assessment is only an estimate of the degree of bone loss, the final assessment of the degree of bone deficiency and the stability of the implant, especially rotational stability, can only made during the surgical procedure. Hence flexibility with the choice of implants and bone graft or substitutes is required. Having assessed the degree and complexity of the bone loss, pre-operative planning of the resection lines will give additional information of the remaining bone deficit. A good basic principle is to try to restore the bone stock to a 'primary' situation as far as possible. In most cases it is possible to restore significant bone stock which will make future interventions much easier to deal with. This is a well accepted principle in hip surgery and the knee is no different. Of the many requirements to achieve satisfactory component survival, implant stability at the time of implantation is paramount. Peripheral rim implant contact with host bone will ensure adequate longitudinal component stability. Eccentric rim support will give rise to angular instability and the use of a stem is mandatory. Rotational stability is achieved in the tibia by baseplate geometry. The addition of flanges and pegs contacting good quality metaphyseal bone provides resistance to rotational displacement. In the femur, the anterior patellar flange and contact with the posterior femoral condyles gives the necessary support to resist rotation. Implant stability is readily achieved where small defects can be resected such that the integrity of the underlying supporting bone is not compromised. However where the deficiency does not allow this, a plan to attain stability is required. Some of the issues that will require careful consideration in planning the procedure include bone graft, implant selection, augments, stems, cones and sleeves, the patella, and soft tissue instability - all of which are discussed below. Bone graft requires specific conditions to facilitate successful incorporation. Unrestricted loading and motion have been shown to be detrimental. Hence the current recommendation is that bone must be protected from excessive stresses while revascularisation and incorporation proceeds. The use of chips for impaction grafting has been shown to work well in contained defects where stability has been achieved. Contact with host bone and, if necessary, the addition of an adequate length of stem, must ensure this stability for this technique to be successful. Preparation of the host bed, i.e. the surface to which the graft is to be applied, must be adequately prepared to maximise incorporation. All dead tissue and foreign material must be removed to expose a vascularised bone bed. The graft-to-host bone configuration may require special attention, such as a step-cut osteotomy for optimal stability of the graft implant construct. Structural grafts are perhaps even more reliant on stress protection. The use of major structural grafts for major deficiency has been pioneered by Gross12 and described by others (Engh et al18). It is important to bear in mind the mechanical changes induced by the irradiation in the preparation of allograft material. The accompanying weakening of the graft material requires that adequate protection against loading during incorporation is an imperative. Generally contained defects are reasonably easily dealt with irrespective of the size. With small residual contained defects the cortical (metaphyseal) rim provides support for the prosthesis. It is reported that defects 5-10 mm can be ignored because they will be effectively filled by PMMA at the time of cement fixation.1 The authors prefer to fill these and those >5 mm with impaction grafting with morcellised bone chips. Central contained defects are invariable with revision surgery. They give rise primarily to rotational instability. Morcellised bone chips can be used to reconstitute the lost bone, and a stem of adequate length and cortical engagement will most often prevent rotation.19 Where stability cannot be achieved metaphyseal filling cones or sleeves should be used. Sleeves function by transferring axial load to the cortex, hence good contact is required and remaining defects around it should be packed with bone chips. Small rim defects remaining after resection are commonly seen. Those on the tibial side involving less than 25% of the tibial surface are best filled with bone chips. On the femoral side if there is component stability with good implant/bone contact restricting all motion, defects involving less than 25% of the femoral surface should be filled by small structural grafts held in place with small screws or temporary fixation, or by bone chips mixed with blood applied at the time of implant cementation. Although the use of PMMA with or without supporting screw fixation is recommended,20 it should only be used in older or low demand patients10 with defects around 5-10 mm and where revision is not anticipated. Alternatively for security, it is a simple matter to use bone graft and a stem. Large rim defects will require careful attention to reestablish longitudinal, angular and rotational stability prior to deciding on the type and extent of the graft, or the necessity for central cones and sleeves. Containment of morcellised graft is problematic. Mechanical testing has shown that impaction grafting is not suited to uncontained defects and the use of mesh has been reported.21 In some type 3 lesions bone chips (mixed with blood) imprinted or pressed into the area can be held in place satisfactorily with the remaining 'eggshell' cortex or the soft tissue sleeve which is sutured over the morcellised graft, provided a long stem is used to impart stability (Figure 3). 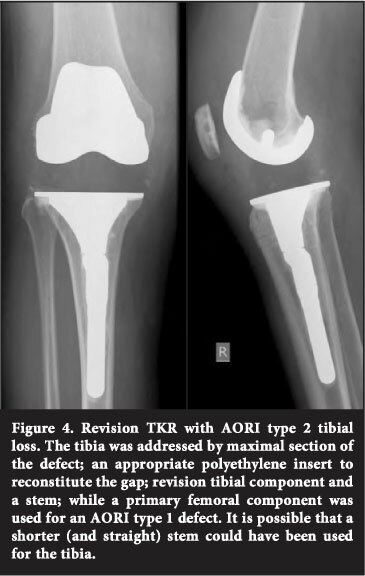 Larger tibial defects can be compensated for by thicker polyethylene inserts (Figure 4). Once the flexion-extension gap exceeds about 40 mm a structural graft or custom-made implant is indicated.3 Structural bone grafting has been advocated for massive bone loss (AORI type 3) by Gross;12 however, there is little evidence that these give better outcomes than custom-made endoprostheses. For non-oncological disease structural allograft can be effectively inserted inside a remaining shell of residual bone. Engh et al8 and the authors believe that on the whole the choice of implant should be as 'simple' and unconstrained as possible. Where bone resection has restored the stability, i.e. AORI 1, and with a surface defect of less than 25% (i.e. 50% of either tibial plateau or either femoral condyle),22 primary implants can be utilised.1,20 However there is consensus that stems greatly improve the implant stability and if any doubt exists it is advisable to add a stem. In our opinion, even for severe bone loss, standard revision implants are preferred to more constrained ones, such as hinged prostheses, providing the soft tissue sleeve is competent. Hinged implants have a distinct disadvantage. They do not mimic the normal biomechanical transfer of stresses across the knee as the knee ligaments do. In the normal anatomical situation the forces are transferred peripherally via long lever arms from femoral to tibial cortices. Instead, with the hinged prosthesis, the forces are centralised to the bone/implant interface resulting in a shorter lever arm by which they operate and the forces are consequently magnified. The result of this is that it promotes earlier loosening. Arguably the indication for the use of a hinged prosthesis is extremely limited. In our opinion it should only be used in the rare instance where the soft tissue envelope is so deficient that it cannot be reconstituted or reconstructed. While there are proponents for uncemented implants,23 the consensus is in favour of using cemented components. Augments are space fillers and are substitutes for bone. They are indispensable on the femoral side where bone graft cannot be easily protected from axial or rotational loading. Where posterior condylar bone loss has occurred the augment restores the loss of rotational stability. The bone deficiency in this location is uncontained and cannot easily be replaced with bone graft alone. Similarly, with the use of the distal inserts, the femoral component can be distalised to overcome proximalisation of the joint line. On the tibial side the use of wedges and augments were popularised by Brooks et al,24 Brand et al20 and others as an easy and effective method of substituting the lost bone.2 Augments, either wedge- or block-shaped, have been shown to be of equal efficacy and that which best fills the defect is indicated.26 While effective, they do not permit the reconstitution of the bone stock, which in young patients may be of significance in future interventions. The choice between cemented or uncemented stems remains controversial. For uncemented stems a fluted or clothes-peg-type termination give good press-fit purchase on host bone when reamed to 'scratch fit' diaphyseal engagement. Uncemented stems require good metaphyseal and diaphyseal bone quality, an endosteal diameter that permits engagement, younger patients with few co-morbidities and with structural allograft constructs. Cemented stems are indicated in situations where firm endosteal contact cannot be achieved because of bone quality and wide stovepipe-like canal. They are not recommended for use with major structural bulk allografts. The authors prefer to avoid full length stem cement fixation due to difficulties encountered with removal and with the residual defect after removal at the time of revision. Despite the disadvantages of the limited inventory provided by the implant companies, particularly of the lengths, it is generally possible to accommodate each situation with these 'off-the-shelf' components. 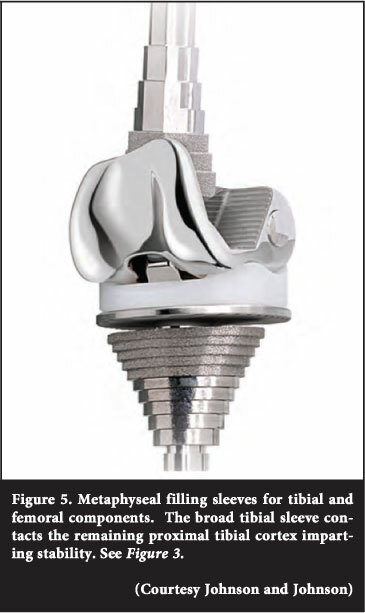 These metaphyseal implants designed for the proximal tibia or distal femur are specifically for use in large central defects and primarily impart rotational stability (Figure 5). They are also advocated in uncontained lesions with deficient rim support where additional resistance to longitudinal and angular stability is required. The use of metaphyseal filling cones or sleeves of highly porous trabecular metal or porous coated material are gaining in popularity.9,16,27,28 They provide a structural fill to large central defects, facilitate biological fixation and have the ability to transfer load to the remaining cortex albeit at some distance from the resection line. Recent reports suggest that the fixation from these devices is adequate in some incidences to avoid the use of a stem - so-called stemless tibial fixation.27 It is also claimed the application of stemless fixation requires less bone preparation thereby reducing operating time; can be employed in the presence of diaphyseal deformity which would complicate stem insertion; and offers more flexibility in placement of the tibial component. The use of cones and sleeves should be restricted to the severe cases where the remaining bone stock is of poor quality; where impaction grafting will fail to achieve implant stability; or, in addition to the above, additional longitudinal and angular support is required. Erosion and bone loss of the patella is usually associated with previously resurfaced patellae, patellar fractures, avascular necrosis or bone tumours. There are a few options for dealing with deficient patella bone stock. These include the use of bone graft and augmentation, a cemented biconvex polyethylene patellar 'button', a trabecular metal patellar prosthesis,29 patellar resection arthroplasty or patelloplasty, the gull-wing sagittal osteotomy described by Vince,30 or as a last resort, a patellectomy. Resurfacing, if this is desired, depends on the remaining bone stock. A minimum of 10 mm of bone is required for conventional resurfacing. It has been reported that highly porous trabecular metal is useful when there is less than 10 mm of bone remaining.29 Alternatively, for a thin remaining shell, the patella can be split along its long axis, the so called 'gull-wing osteotomy'30 which allows better patellar tracking. Surprisingly, a very functional alternative is to leave the patellar shell unresurfaced when this cannot accommodate a patellar button (Figure 6). Our recommendation is to reconstruct where possible, and to leave the patellar shell unresurfaced where this is not possible. The 'gull-wing' osteotomy or 'reshaping' of the patella can be added if patellar tracking can be improved. If the extensor mechanism fails to rehabilitate adequately, or is found to be unrepairable, a reconstruction with a composite allograft can be undertaken. It is seldom that one encounters the situation where it is not possible to restore the soft tissue envelope balance by adequate restoration of the joint line. In the primary intervention, complete removal of osteophytes and judicious ligament releases will achieve balance. Where ligament insufficiency is encountered, reconstruction of the collateral is advised. The Krakow technique can be used on both the medial and lateral sides to retension the deficient structure.4 In addition, allograft reconstructions can be employed with or without this procedure. The use of constrained or hinged implants should be reserved as the last resort. A synopsis of management is presented in Figure 7. Despite the numerous articles reporting solutions to the problems encountered with restoring bone defects there are still many unanswered questions. Currently 'stability' is decided on information gained from the radiographs and visual inspection at the time of surgery. The interpretation of the radiographs can be subjective and difficult. The precise point at which there is insufficient bone for implant stability is open to debate. Once implanted the surgeon is expected to assess implant stability from the observation of macroscopic motion caused by manual manipulation. How much motion is enough, or how much force must be applied, has not been defined. Burnett et al identified a subgroup of patients who had significant bone loss but with well-fixed components.6 Similarly Engh et al reported on the retention of well-fixed implant treated with bone graft and polyethylene exchange.32 These patients were treated with retention of the implants with curettage and focal bone graft. We would like to caution that every effort must be made to confidently exclude low grade infection, particularly of organisms like Propionibacterium acnes before accepting the status as non-infected. If in doubt, especially in 'young' patients, it may be prudent to revise all components rather than to perform a focal bone graft and polyethylene exchange. 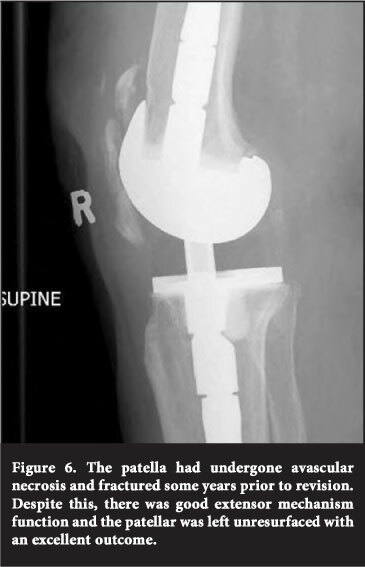 The satisfactory management of substantial bone defects in total knee arthroplasty requires a careful appraisal of the extent and location of the defects, and exhaustive pre-operative planning to ensure that a full range of bone graft or substitutes and the appropriate equipment is available to cope with all eventualities. Using a classification system, like the AORI classification, is useful to focus attention on the nature and extent of the problem and to lend assistance in the treatment decision-making process. The surgeon must have a thorough knowledge of the individual implant systems and their limitations. Each case should be individualised, regarding implant choice, the requirements for implant stability and the means to reconstitute the lost bone.